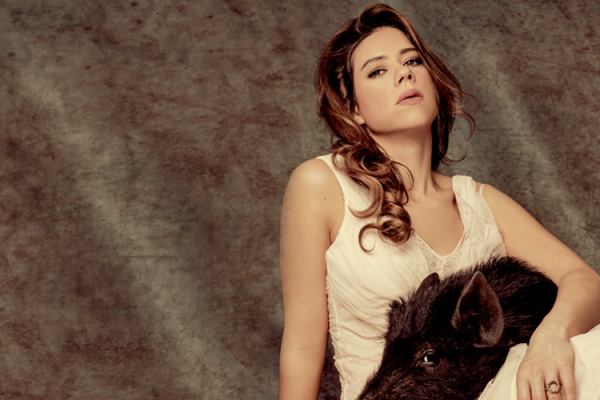 One of Britain’s most original comedians, Lou Sanders makes her Dukes debut this spring. During her first national tour, Lou calls into The Dukes on May 22 with her award winning show – Shame Pig. This show is all about shame. Sanders has met some pigs – and been a mucky little pig herself – and she’ll be rolling around in her own filth for the audience’s delight at The Dukes. Already an acclaimed stand-up, Lou won the Comedian’s Choice Award at the Edinburgh Fringe Festival for Shame Pig where she talks about stabby stepmothers, alcohol issues and an unusual sexual encounter in LA. Lou recently has supported Katherine Ryan in the West End and her television appearances include 8 Out Of 10 Cats Does Countdown, The Russell Howard Hour and Comic Relief and she regularly features on Radio 4’s Unbelievable Truth. As a writer, Lou wrote and starred in the short film Elderflower. She has also written for 8 Out of 10 Cats, Mock the Week, Stand up for the Week and Miranda Hart. Shame Pig is recommended for anyone aged 16 plus and tickets are priced £12.